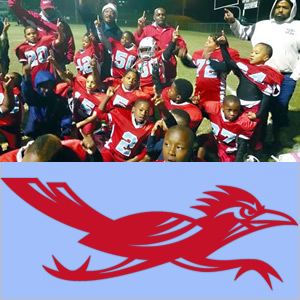 The Baby Roadrunners have been a member of the Knox Metro Youth Football League for more than 30 years. This long-standing relationship between our organization and the Knox County Parks & Recreation Department (KCPRD) and the Knoxville Parks & Recreation Department (KPRD of Knoxville, Tennessee) has established a winning tradition of providing positive influences in the development of many of our inner city youth. Our Youth Football and Cheerleading programs are committed to developing future leaders. We are a non-profit organization that provides youth, ages 4-14, an opportunity to learn good sportsmanship by having fun and learning the fundamentals of sports. We teach them both teamwork and leadership by providing them with positive role models and by fostering consistent parental support. Baby Roadrunners teams are separated by age, weight, and skill. A strict age and weight matrix provides that all of our youth athletes participate in the proper division. We adher to the division rules that are established for all Knox Metro Youth Football League teams.